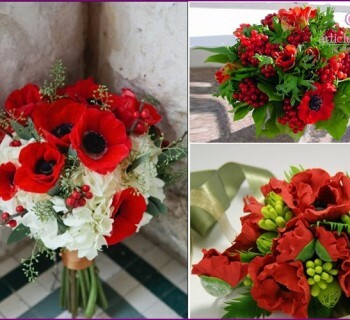 A new trend in fashion and wedding floristryconsidered bouquets from brooches. This unusual and beautiful masterpiece perfectly complement the image of the bride, harmonizing with her dress, veil, shoes and other accessories. 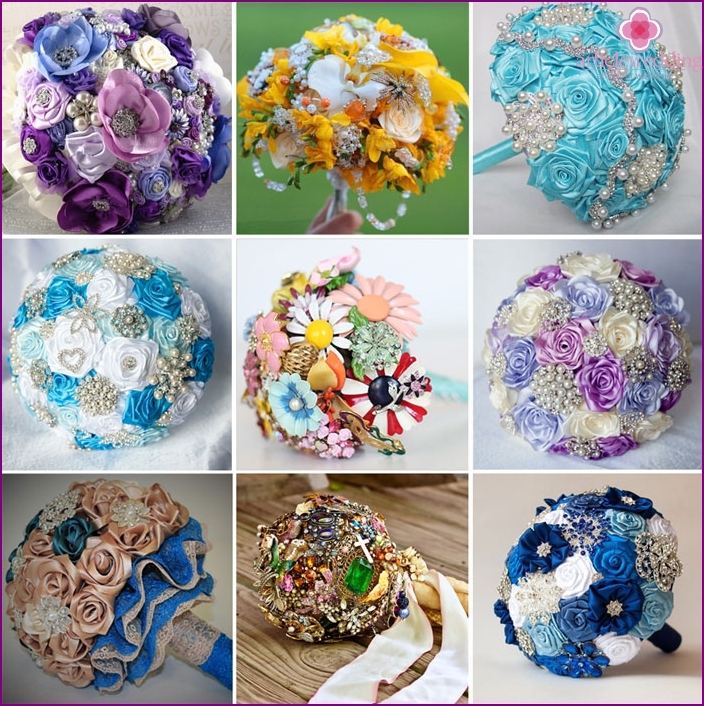 Bouquets made of brooches can be poured incredible colors, attracting the attention of others and causing rave reviews. This attribute will accompany the bride to the whole wedding, and after it will become a family heirloom that you can give to children or grandchildren. Flowers brooch do not cause allergies of the bride. Such a composition is suitable for winter weddings as jewelry flowers do not lose their appearance due to weather conditions. Elements of this accessory will shine with all colors of the rainbow, surprising others. Individual design brooch bouquet provides a guarantee of obtaining a bride unique masterpiece, an analog that does not exist. Bouquet can be composed with ornaments that belonged to my mother or grandmother. This accessory will become a talisman for the bride at the wedding. Brooch bouquet you will be able to take a honeymoon for the original photo shoot. Bouquet brooch differs significantly by weightligaments traditional colors. Therefore thrown bouquet can cause injury to the girls, who are trying to catch him. To avoid such situations, the bride must have left a small bouquet second understudy, made of fresh flowers. If the bride at the end of the wedding decided to part withbrooch bouquet, there is an alternative to the tradition of throwing an accessory. New custom also suitable for the detection of an unmarried friend who will soon be married. To this end, the bride takes in hand brooch bouquet and ribbons on the number of friends. Every girl should take the ribbon and pull over. That friend, who got the bouquet should store it at home. 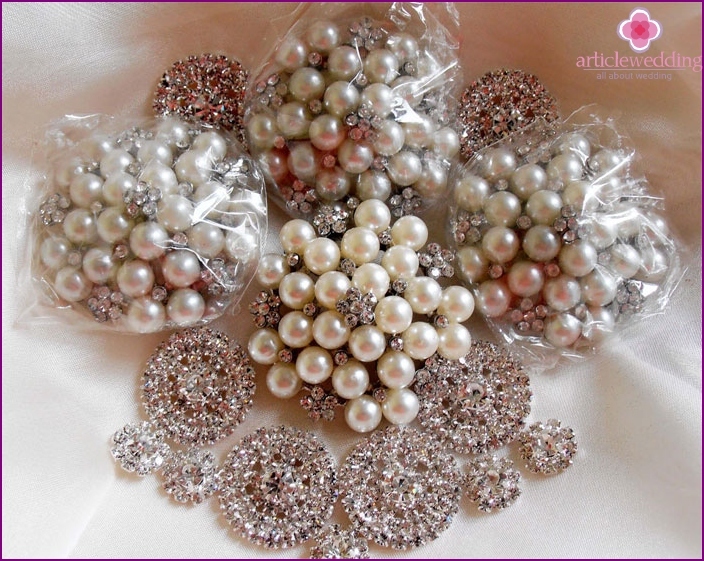 To bouquet-brooch combined with your wedding, the main color to choose crafts in the tone of your celebration. Before creating a bouquet of brooches you need to decide how it will look like the final result. Consider the shape and size of the product, as well as decide the length of the legs. Boutonniere for the groom need to stylize a bridal bouquet and also be made of brooches. Bouquet of the witness should be in harmony with the newlyweds accessories. To produce this work of art will be able toevery bride, if carefully carry out all the steps of the master class. To get a high-quality and original masterpiece, you need to have patience. To create a bouquet of brooches you will take from a few weeks to a month. Duration of manufacturing depends on the need for careful selection of materials, which would be combined with each other in style, color, hue. Melt. 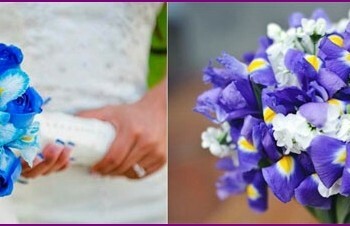 This device will help glue together small and large parts of the bouquet together. The thermal adhesive has a transparent color that will allow any visible connecting elements. The result of this procedure is robust and durable. Floral wire. 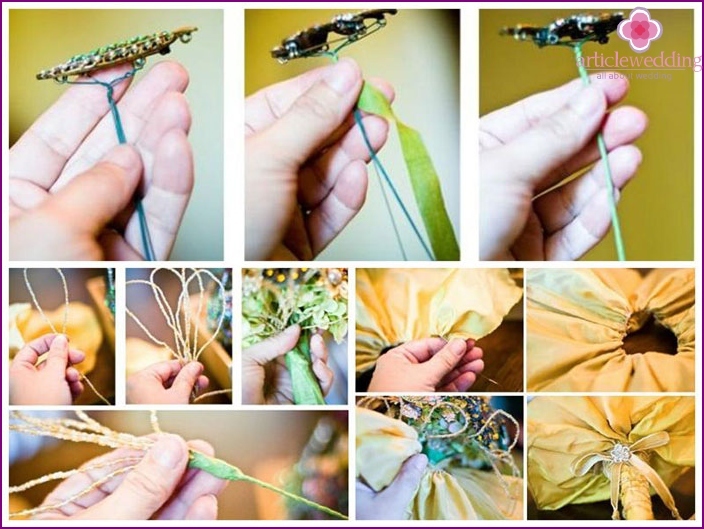 For a bridal bouquet, you will need to prepare a hank green wire. This material is used for fixing brooches, flowers and beads. Scissors. They should be durable, so you can cut the fabric parts except as floristic wire. Tongs, nippers, pliers. These are necessary tools that will help you fix a metal brooch or cut several layers of wire. Beads, beads. These small elements complement the wedding song and give a bouquet of tenderness. This season is very popular pink or cream color. Jewelry. To make a bouquet of luxury, choose a brooch with precious stones or metal. Bijouterie. A more economical but no less beautiful, it is considered bouquet decor of jewelery products. You can review the contents of the home box and choose a brooch, earrings, lockets, rings, pendants, cufflinks, pendants. For one, the bouquet, you will need about 45-50 items. If your home is not found such a large number of accessories, visit the jewelry store and pick suitable items. Prepared the tools and materials necessaryplaced on the desktop, leaving the front of all the necessary details. 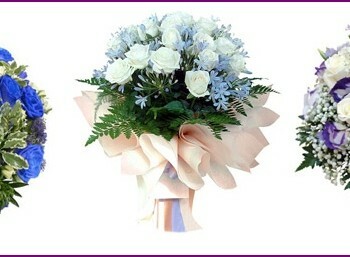 Proceed to the top job after how to determine the color and shape of the bouquet. The entire process of creating a masterpiece of the wedding should take place in a good and positive mood. Your state of mind will give positive energy flowers that will bring good luck on the day of celebration. Take a satin ribbon and opal region. Then the upper left corner of the tape need to bend down and make amends hand. Atlas lends itself well to such a fixation, while maintaining the desired shape. The bent angle gradually tighten the inside. Do this carefully so as not to damage the tape. The resulting tube lock thread. Around this tube tighten the remaining tape, carefully forming rose petals. Using the whole tape, fix the resulting bud thread. 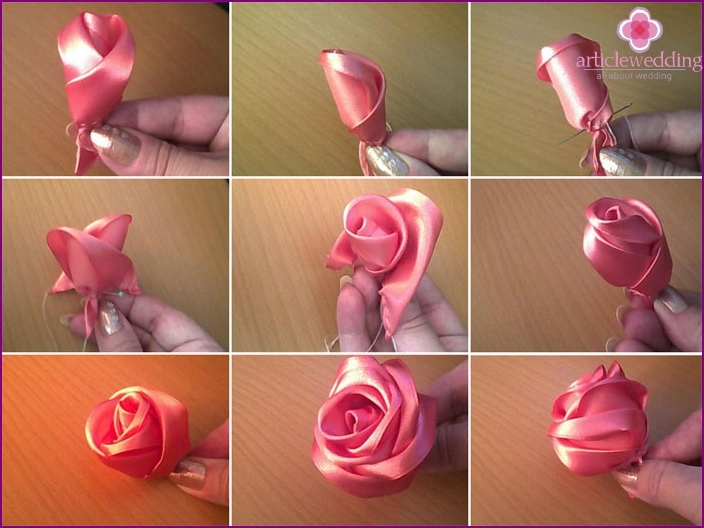 To make one satin roses it will take about a minute. Then, similarly to create a 30-40 colors that can be placed on a wedding bouquet. Each rose is necessary to make the stem. Take floristic and cut the wire 15cm. At its end, create a small loop. Melt put a drop of glue on the loop, and then firmly press the base of the flower. After a minute the rose has dried, you can then use it to form the bouquet. Repeat this step with all the trained roses. The individual elements. To do this, take a large diameter bead and fix it to the floral wire, forming a dense stem. Do a similar effect with 20 beads. Hanging beads. Decoration bouquet bottom can perform hanging beads. To do this, you need to take a tight line and put on her 10 beads of the same color. The ends of the tie between a fishing line or tighten Melt. All prepared elements gradually collect in the overall composition. Large parts place at the edges, and small should be placed closer to the middle. First collect all the stems into a bundle of satin roses and fix each other with wire. Then place the flowers between single beads and beads. Thereafter prepared brooches place randomly throughout the shape of the bouquet. Handle composition attach satin ribbon and lace wrap. Ready bouquet-brooch out of the vase before the wedding. 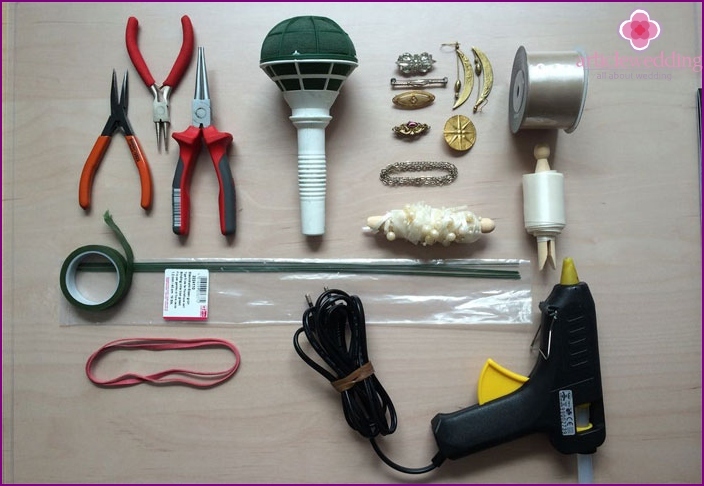 If you want to make your own wedding bouquet, brooch, watch the video below. With the help of an experienced florist you gradually create an original masterpiece of satin ribbons, pins and brooches.